In many countries across the world, the demographic compositions of universities have changed with the increasing numbers of international students. According to the OECD (2014) in 2012 there were 4.5 million students studying at universities in countries other than the ones in which they had been born. It was more than double the number in 2000. International student mobility is a result of globa… lisation and the internationalisation of higher education. This book reviews these developments as they relate to Africa. 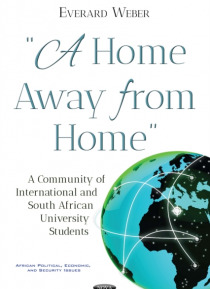 It examines the changing social relations of diversity of postgraduate South African and international students living together in residence at the University of Pretoria. It is an instrumental, qualitative case study based on content analyses of semi-structured interviews with more than 90 students. There is a dearth of such studies in African higher education. The academic literatures have concentrated on educational change at national, continental and global levels. It is unknown what is happening on the ground, from the point of view of the daily experiences and perceptions of local and international students. This research project draws on community studies to analyse the sociology of three residences at the University of Pretoria, at which most of the postgraduate international students live with their South African peers. The majority of the international students come from other African countries. This community, across the three sites, is analysed in relation to the intersectionality of race, socio-economic class, gender and sexuality and, especially, nationality. These social relations embedded within the residence-community constitute a fundamental characteristic of globalisation: The inter-relationship between the nation state (nationality) and the international developments (globalisation and internationalisation) that have undermined the nation state's independence and autonomy. The problem is viewed at the cultural coalface at one university community, rather than systemically and structurally from the top. Put another way, students constantly engage with representations of where they come from and the global realities they encounter at the university. This is illustrated in analyses of the intersectionality of diversity relations. The author shows the range, complexities and specificities of diversity and its changing social dynamics. It is hoped that such studies can be compared with others in international education in Africa, the global South and the developed world.